Welcome to The Cancer Journey – Positive steps to help yourself heal. This inspirational and compelling book provides the blueprint for dealing with cancer and is the book of choice for anyone affected by this disease. The shocking 2011 statistics are that 42% of us will develop cancer in our lifetime. It is now a worldwide disease with more than 15 million people in the UK alone expected to be diagnosed by 2020. Polly, Pam and Nick have written this book to help you. They have all had their own different cancer diagnoses, and feel passionate about sharing the information they have gathered which has helped them understand and cope throughout their journeys. They have written it in a warm, compassionate style with gentle humour, offering comfort and practical advice for anyone affected by cancer including family and friends. What should you eat, what shouldn’t you eat? How do you deal with the side-effects? How do you politely tell others “I have cancer” without triggering an uncomfortable silence! How to prepare for medical appointments and get the best out of your doctors. What can family and friends do to help? They talk about everything and tell you stuff you need to know that no-one else, including your health care professionals, can or will tell you. Special Offer as a thank you to our followers. 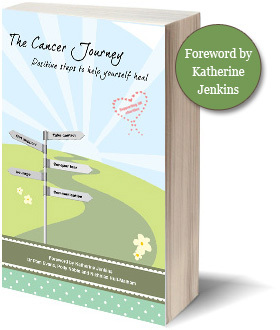 Buy The Cancer Journey Book from here. We ship to the UK and Internationally, so please choose the correct postage for your location. I love The Cancer Journey book! It’s all excellent. I think what is different about it compared to other books on cancer is that it’s clear that it is written by someone who actually knows what it’s like, not by a 3rd party and hear-say. That comes across throughout. The other areas which were my favourites are the communication, food & recipe sections but in particular the family & friends chapter. I could comment on all of it in a positive tone all day! I have just finished the book and was truly inspired by the positive focus the 3 authors have on dealing and coping with cancer. My wish is that this book had been available when my dad was diagnosed 12 years ago. My Dad and I would have coped so much better and possibly we both could have led a more normal life. I totally love your book The Cancer Journey – I think it will help loads of people. I found The Cancer Journey to be a well constructed and informative book dealing with issues we all try to avoid and generally shy away from. The subject is discussed in a tactful and sympathetic manner and is easy to digest. I feel it will go a long way towards alleviating the general fear and taboos associated with cancer. It will serve as a hand book not only for cancer patients but also medical practitioners and alternative healthworkers.